The Turnout is either a manual or an electronically operated turning seat. 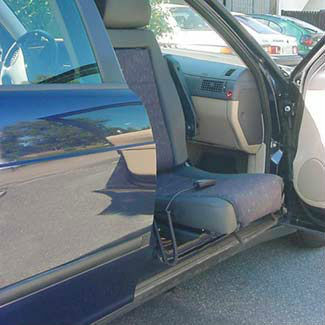 This allows easier hoisting or transfer of a person onto a car seat, and then into the car. The seat can be installed into either the drivers or passengers seat, depending on requirements. 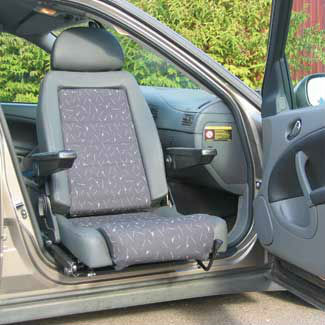 It is recommended that the turnout is fitted with a BEV seat, which lowers the seat height, allowing extra space for moving in and out of the car. The Turnout bolts into the standard seat mountings, allowing it to be easily removed, and replaced with the original seat if the car is sold. The Turnout has been crash tested and certified to the appropriate standards, with an approved user load of 150kg. The Turnout is also available in the Turny Orbit option, allowing the seat to lower up to 395mm closer to the ground for even easier transfer into the vehicle.